This article applies to version 1 of Data Factory. If you are using the current version of the Data Factory service, see update machine learning models in Data Factory. This article complements the main Azure Data Factory - Azure Machine Learning integration article: Create predictive pipelines using Azure Machine Learning and Azure Data Factory. If you haven't already done so, review the main article before reading through this article. Create an experiment in Azure ML Studio. 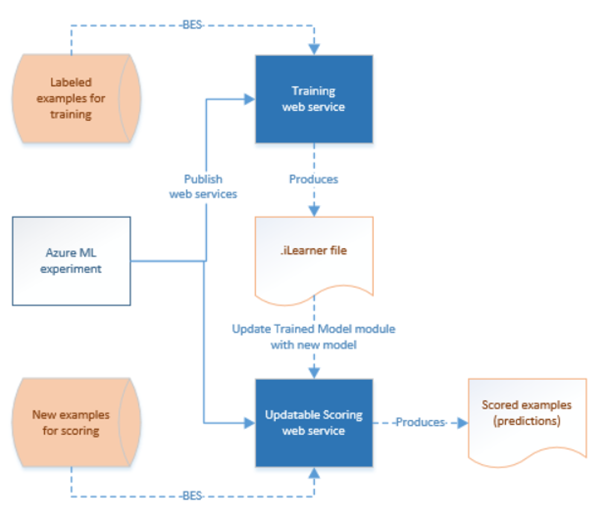 When you are satisfied with the model, use Azure ML Studio to publish web services for both the training experiment and scoring/predictive experiment. The following table describes the web services used in this example. See Retrain Machine Learning models programmatically for details. Training web service - Receives training data and produces trained models. The output of the retraining is an .ilearner file in an Azure Blob storage. The default endpoint is automatically created for you when you publish the training experiment as a web service. You can create more endpoints but the example uses only the default endpoint. Scoring web service - Receives unlabeled data examples and makes predictions. The output of prediction could have various forms, such as a .csv file or rows in an Azure SQL database, depending on the configuration of the experiment. The default endpoint is automatically created for you when you publish the predictive experiment as a web service. The following picture depicts the relationship between training and scoring endpoints in Azure ML. 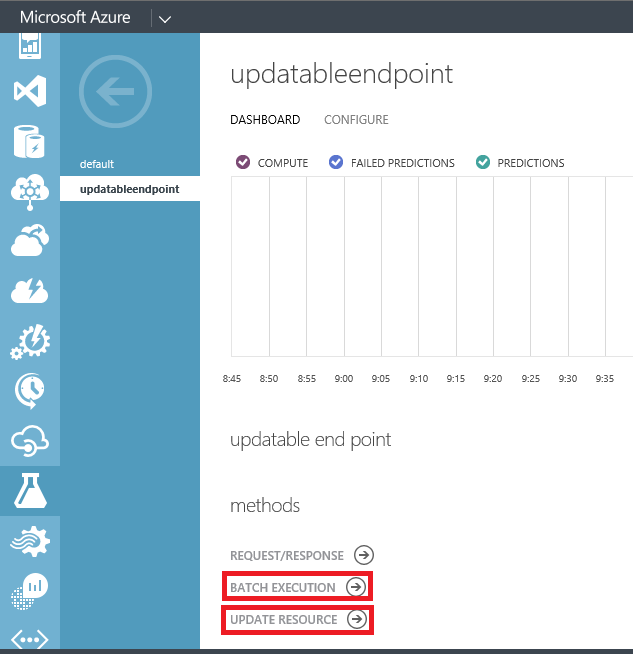 You can invoke the training web service by using the Azure ML Batch Execution Activity. Invoking a training web service is same as invoking an Azure ML web service (scoring web service) for scoring data. The preceding sections cover how to invoke an Azure ML web service from an Azure Data Factory pipeline in detail. Click BATCH EXECUTION to get the URI value for the mlEndpoint JSON property. Click UPDATE RESOURCE link to get the URI value for the updateResourceEndpoint JSON property. The API key is on the endpoint page itself (in the bottom-right corner). The following example provides a sample JSON definition for the AzureML linked service. The linked service uses the apiKey for authentication. The following scenario provides more details. It has an example for retraining and updating Azure ML models from an Azure Data Factory pipeline. This section provides a sample pipeline that uses the Azure ML Batch Execution activity to retrain a model. The pipeline also uses the Azure ML Update Resource activity to update the model in the scoring web service. The section also provides JSON snippets for all the linked services, datasets, and pipeline in the example. Here is the diagram view of the sample pipeline. As you can see, the Azure ML Batch Execution Activity takes the training input and produces a training output (iLearner file). The Azure ML Update Resource Activity takes this training output and updates the model in the scoring web service endpoint. The Update Resource Activity does not produce any output. The placeholderBlob is just a dummy output dataset that is required by the Azure Data Factory service to run the pipeline. training data. The input data for the Azure ML training web service. iLearner file. The output from the Azure ML training web service. This file is also the input to the Update Resource activity. The following dataset represents the input training data for the Azure ML training web service. The Azure ML Batch Execution activity takes this dataset as an input. The following dataset represents the output iLearner file from the Azure ML training web service. The Azure ML Batch Execution Activity produces this dataset. This dataset is also the input to the Azure ML Update Resource activity. The following JSON snippet defines an Azure Machine Learning linked service that points to the default endpoint of the training web service. Click WEB SERVICES on the left menu. Click the training web service in the list of web services. Click copy next to API key text box. Paste the key in the clipboard into the Data Factory JSON editor. In the Azure ML studio, click BATCH EXECUTION link. Copy the Request URI from the Request section and paste it into the Data Factory JSON editor. The following JSON snippet defines an Azure Machine Learning linked service that points to the non-default updatable endpoint of the scoring web service. The Azure ML Update Resource activity does not generate any output. However, Azure Data Factory requires an output dataset to drive the schedule of a pipeline. Therefore, we use a dummy/placeholder dataset in this example. The pipeline has two activities: AzureMLBatchExecution and AzureMLUpdateResource. The Azure ML Batch Execution activity takes the training data as input and produces an iLearner file as an output. The activity invokes the training web service (training experiment exposed as a web service) with the input training data and receives the ilearner file from the webservice. The placeholderBlob is just a dummy output dataset that is required by the Azure Data Factory service to run the pipeline.